LinuxLookup established roots as an information portal back in 1999 and was one of the first websites to provide independent coverage of Linux & Open Source news, review articles, support forums and related literature all in one place. This defined us early on as a popular online destination for the Linux community. In 2008 we decided to change the direction of LinuxLookup, focusing only on product reviews and howto guides. No longer publishing daily news stories. Instead, in an effort to exhibit the ever changing flow of Linux & Open Source information, we've created LinuxLeak. A daily destination which aggregates all the latest happenings, news stories, articles, podcasts, photos, videos and software releases straight from over 200 websites in the Open Source community. 2010 will mark yet another migration point as we launched OSEqual, an Open Source software search site which provides equivalents to popular commercial software for Windows, Mac and other Devices. LinuxLookup is under the sole control of our editors. Since we firmly believe in distinguishing our independent editorial content through words, design, and placement from promotional information, our articles are all written and edited under a "call it like we see it policy" to assure unbiased content. In other words, there are no advertorials here, regardless of who advertises on our site. 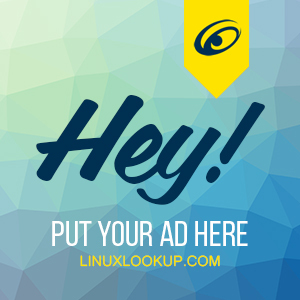 You may put trust in that LinuxLookup will always offer an unbiased evaluation of hardware, software, and other products while providing a robust information platform for the community. VERSION 5 LAUNCH: Built from the ground up today we launched a new site design. VERSION 4 LAUNCH: A new intuitive design, along with major code updates and features, today we introduce version 4. VERSION 3 LAUNCH: After stepping back from the Linux community to re-evaluate our direction, Linuxlookup launches again with an entirely new backend and enhanced features. VERSION 2 LAUNCH: We launched LinuxLookup version 2 today. The new site is 100% database driven, greatly improving content organization and functionality. Not to mention new user features. GRAND OPENING: The domain LinuxLookup.com was purchased and all content from the original site was migrated over. We officially have our own domain, wish us luck.